The wife of the former Interpol president who disappeared in China has revealed that she had received a threatening phone call warning of agents coming for her while she fights a so-far fruitless battle for information about her husband’s fate. Meng Hongwei – who is also China’s vice minister of public security – disappeared while on a trip home to China late last month. A long-time Communist Party insider with decades of experience in China’s sprawling security apparatus, the 64-year-old is the latest high-ranking official to fall victim to a sweeping purge against allegedly corrupt or disloyal officials under President Xi Jinping’s authoritarian administration. Speaking to the AP late Monday at a hotel in Lyon, France, where Interpol is based, Grace Meng said her last contact with her husband was by text message, on Sept. 25, when he wrote “wait for my call” and sent her an emoji image of a knife after traveling back to China. After a week with no subsequent news, and on an evening when she was at home in Lyon having put their two young boys to bed, she then got a threatening call on her mobile phone from a man speaking in Chinese. As a result, Mrs. Meng is now under French police protection. 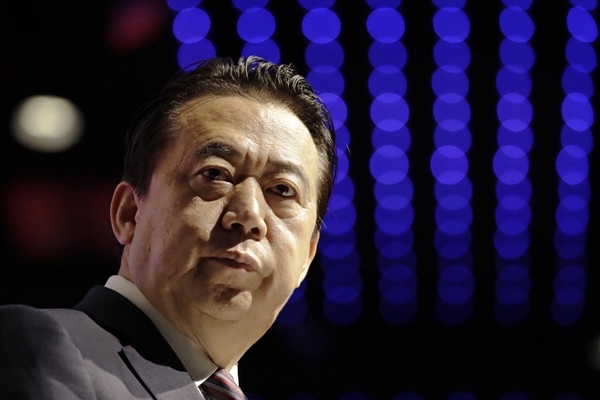 Chinese authorities said Monday that Meng Hongwei was being lawfully investigated for taking bribes and other crimes that were a result of his “willfulness.” Hours earlier, Interpol said Meng had resigned as the international police agency’s president. It was not clear whether he did so of his own free will. “As his wife, I think he’s simply incapable of this,” she said. She said she would be willing to make their bank accounts public. She said that she spoke out in hopes that doing so might help other families in similar circumstances. Mrs. Meng refused to provide her real name to the AP, saying she was too afraid for the safety of her relatives in China. It is not customary for Chinese wives to adopt their husbands’ names. Mrs. Meng said she has done so now to show her solidarity with her husband. Her English name, Grace, is one she has long used, she said. Next articleMacron vows tax cuts, pay rise; will France's anger subside?